Sukute sits a couple of hours north of Kathmandu in a rural district called Sindhupalchok. Though it’s well-connected by good roads to Kathmandu, this mountainous sub-tropical district is one of the least developed and poorest in all of Nepal. The Sun Khosi and Bhote Khosi rivers flow through here, attracting kayakers and rafters. It’s how I first found the place 30 years ago. Over the years, along with my friends and partners, we’ve built a school, a river resort, and a life out here. Arriving yesterday was surreal. Old friends picked me up at the airport in Kathmandu, which had just re-opened after the second 7.3 magnitude quake hit 24 hours earlier. A 5.4 magnitude aftershock shook Kathmandu 10 minutes before we touched down. The airport seemed surprisingly normal when I landed. The only sign of anything unusual were the rows of large United Nations-marked pallets lining the runway. My friends were on their way out of the city – part of a mass exodus out of Kathmandu, with hundreds of thousands of residents leaving for “safer” surroundings. 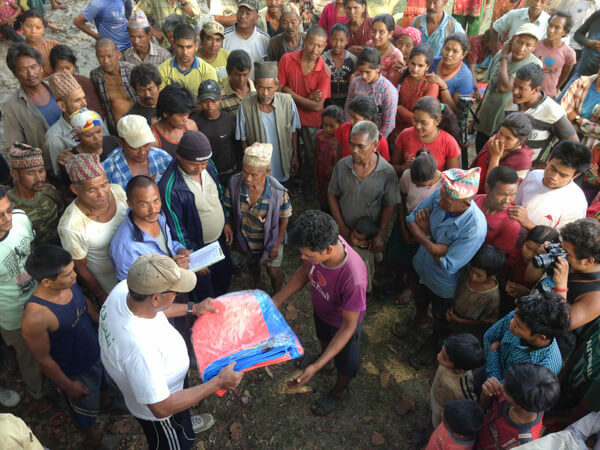 At their urging, I decided to skip going into the city for now and headed straight for Sukute to join Mahendra and his growing relief/aid operation now based out of our resort. It wasn’t until we crossed the Sun Khosi river at Dolaghat and entered Sindupalchok that the aftermath of the earthquake became apparent. Once bustling roadside villages and bazaars that usually line the road all the way to the China border were now just piles of rubble. Local residents were still picking by hand through the wreckage in an effort to salvage household possessions. Describing the scene as apocalyptic would not be an exaggeration. 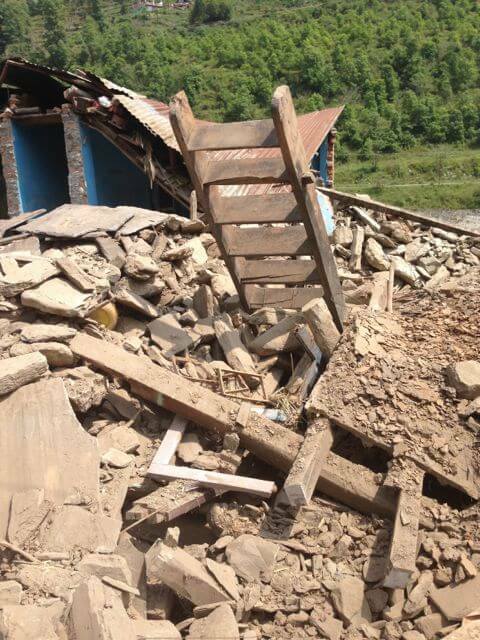 I’m told that next to Langtang, where the entire village was buried under a massive landslide, this area has been the hardest hit by the earthquakes. Pulling into Sukute has always felt like coming home, but there is no escaping the destruction here. The Canadian army is the main international aid group on the scene. 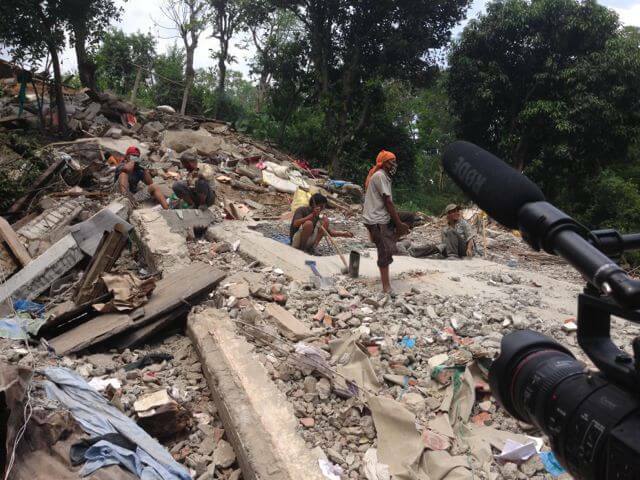 They’ve been working with Mahendra as first responders finding survivors, distributing aid, and surveying damage. 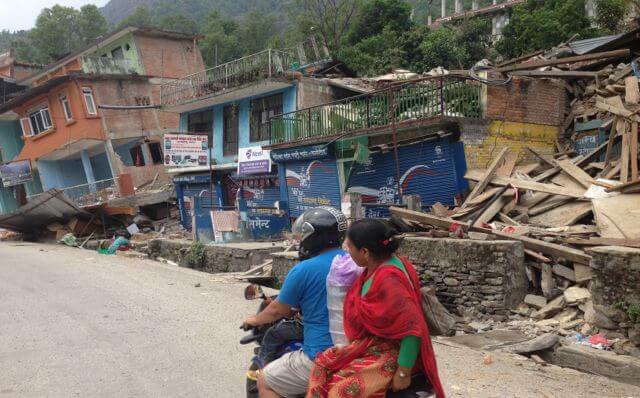 There are 7 villages in relative proximity to us and all have suffered extensive, catastrophic damage. The damage increases the further up valley you go, as the foothills grow steeper. I’m told up to 90% of all structures are gone in places. The school my UK partner Anthony built here is leveled. The village closest to us had just undergone a massive septic upgrade to toilets about a year ago – a major achievement in a context where the average annual income is around $300 USD. Sadly, these improvements, like their homes, are now gone. Thanks to the generosity of friends at home in Ketchum, Idaho, we’ve supplied tarps/shelters for over 1,000 people. Villagers from remote hilltop communities arrive at our camp in a steady stream to pick up them up. Seeing the gratitude on their faces moves me to tears. I watch Mahendra as he carefully logs each villager’s name to ensure each shelter goes where it’s supposed to. The overwhelming heat and humidity remind me that monsoon season will come in less than 3 weeks. 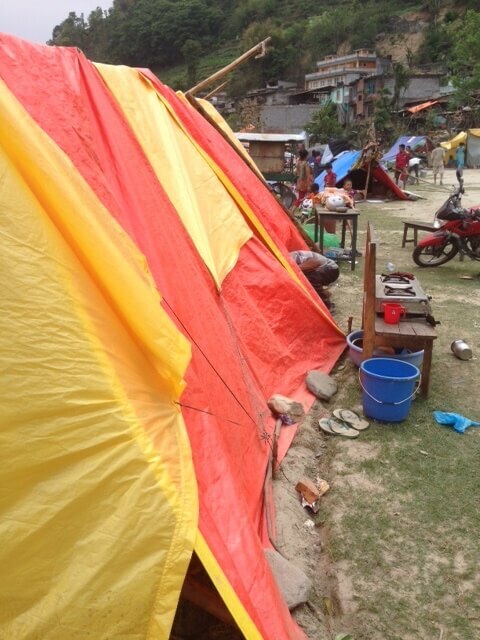 These tarps are desperately needed right now, but they offer little long-term shelter against the unrelenting, torrential downpours that will soon be here. On top of that, the earthquakes have visibly fractured the surrounding foothills. With the heavy rains, landslides are sure to begin causing further challenges. It’s heartbreaking to know that everyone will have to hang on somehow until real re-building can begin in the fall.